Using the HubSpot integration with Sakari, you can send and receive SMS messages directly from your HubSpot account. 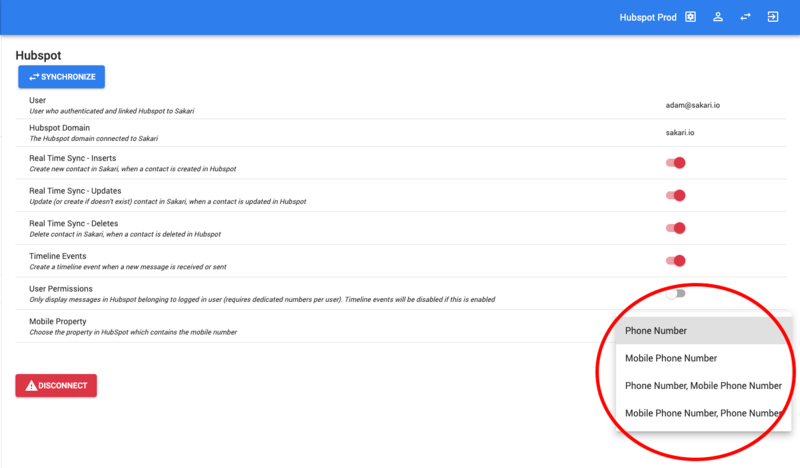 You can automatically trigger personalized message templates using workflows, send individual messages to any contact and view and respond to contacts responses. All activity is tracked and recorded on the contacts timeline. 4. 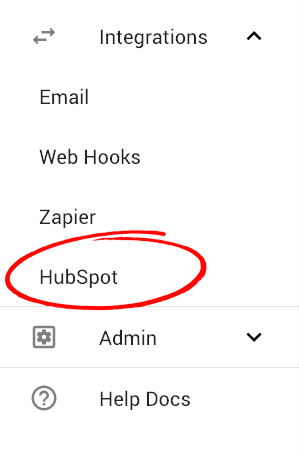 Now you'll connect your HubSpot account. Click the account that you want to connect to your Sakari SMS account. 5. 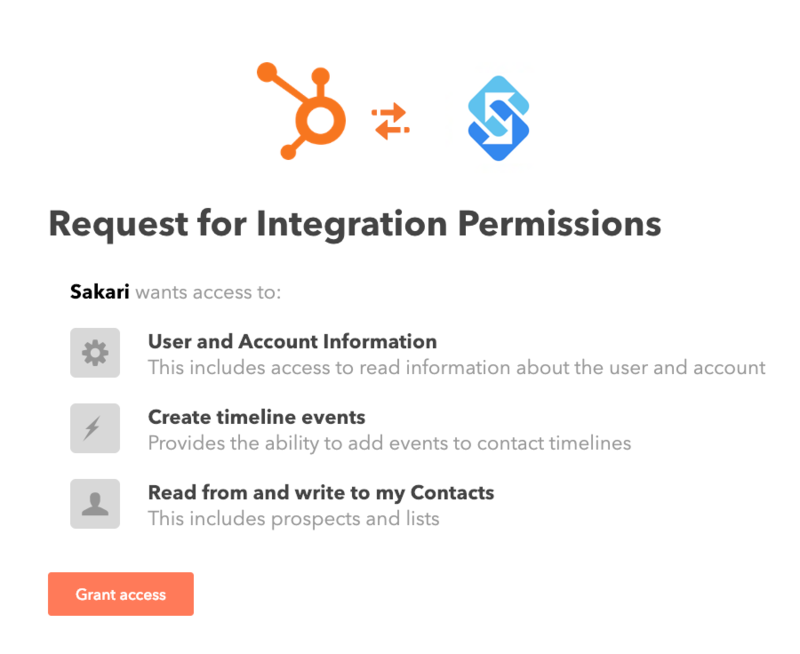 Now you need to grant permissions to Sakari to sync with HubSpot. Click the "Grant access" button in the lower left. 6. Now we've connected Sakari and HubSpot. By default, Sakari is setup to sync with HubSpot whenever a new contact is added, removed or updated. We recommend keeping these settings all on. Real Time Sync - Inserts - Create new contact in Sakari, when a contact is created in Hubspot. We recommend keeping this on. Real Time Sync - Updates - Update (or create if doesn't exist) contact in Sakari, when a contact is updated in Hubspot. We recommend keeping this on. Real Time Sync - Deletes - Delete contact in Sakari, when a contact is deleted in Hubspot. We recommend keeping this on. Timeline Events - Create a timeline event when a new message is received or sent. We recommend keeping this on. User Permissions - Only display messages in Hubspot belonging to logged in user (requires dedicated numbers per user). Timeline events will be disabled if this is enabled. This should only be used if you have user-level phone mapping in Sakari, please contact us for more information. Mobile Property - Choose the property in HubSpot which contains the mobile number. You have a choice of your preferred phone number field mappings (see point #7 for more information). 7. Now we need to decide what field should be used in HubSpot to identify the contacts mobile phone number. 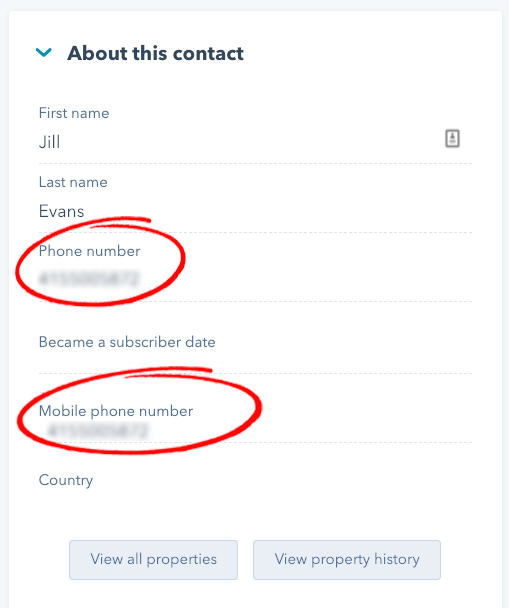 There are two default phone number fields in HubSpot: "Phone Number" and "Mobile Phone Number." Sakari can only only recognize a single phone number with each contact to send text messages against. You need to select what is the preferred phone number field to use for sending text messages. Phone Number - Only the phone number field will be used to send text messages against. If this field is null, you will not be able to send any text messages with the contact. Mobile Phone Number - Only the mobile phone number field will be used to send text messages against. If this field is null, you will not be able to send any text messages with the contact. Phone Number > Mobile Phone Number - Sakari will attempt to use the phone number field for each contact first, if that field is null, the mobile phone number field will be used. Mobile Phone Number > Phone Number - Sakari will attempt to use the mobile phone number field for each contact first, if that field is null, the phone number field will be used. Select your preferred field and click "SAVE." 8. Now we need to do a one-time sync to pull in your contacts from HubSpot in to Sakari. Going forward, these updates will happen automatically whenever a contact is added, removed or updated (assuming you've left these options on, as noted in step #6). Click the blue "Synchronize" button. A popup will appear, click the "Confirm" button to begin the synchronization. After the synchronization is complete, you'll receive an email. This may take a few minutes, depending on the number of contacts you have. Note: Only contacts with a "Phone Number" (or "Mobile Phone Number") field from step #7 will be added as a Sakari contact. 9. You're done! You've connected your Sakari account to HubSpot and you've synced all of your existing contacts to Sakari.